Discovering Celebrity Winemakers: Who's Next? Thanks to the increased marketing potential of celebrities, winemaking has become the chic hobby of choice for the world’s rich and famous. Whether actually buying a vineyard or simply partnering with a well-known vintner, Hollywood celebrities Johnny Depp and Steven Seagal; rock stars Santana, Bob Dylan, and Sting; famous pro-football athletes Joe Montana and Terry Hoage; American auto racing stars Mario Andretti and Jeff Gordon; and internationally acclaimed golfers Arnold Palmer and Greg Norman have all soiled up and put down grape-stomping roots both in the United States and abroad. Most celebrities run wineries because they’re wine connoisseurs. Fame brings them wealth, and they can afford to invest in the hobby, an important consideration when Napa Valley land is currently priced at $200,000 to $400,000 an acre. While a select few choose to keep their vintages private, most celebrities make their wines available for purchase and their estates open for tastings and tours. Not surprisingly, the public’s response has been overwhelmingly positive. 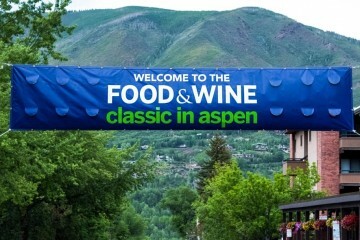 Amongst well-known celebrities involved in the wine industry, we can list Madonna, Wayne Gretzky, Dan Aykroyd, Mike Weir, Tommy Lasorda, Jerry Garcia, Mariah Carey, Lorraine Bracco, Larry Bird, Fess Parker, Francis Ford Coppola, Greg Norman, Ernie Els, Gérard Depardieu, Carole Bouquet, Olivia Newton-John, Barbra Streisand, Michael Schumacher, Paris Hilton, Cliff Richard, Sam Neill, and many more. Although the convergence of wine and celebrity is hardly a new phenomenon, the public is taking a growing interest; visitor attendance at celebrity vineyards has been surging. There are even a number of celebrities getting into the wine business for either passion or enterprise by producing their own line of wines from their own vineyards. So if you’re a wine aficionado, check out these popular celebrity wine makers who grow and process grapes into a delicious wine. 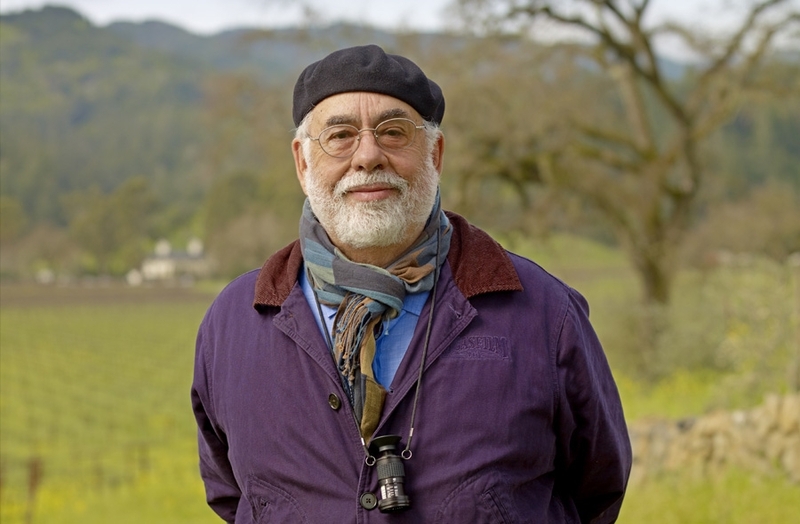 Amongst the dozens of celebrity wine makers, Coppola is definitely the “king.” Winemaking has been a Coppola family tradition for several generations. Agostino Coppola, Francis’s grandfather, used to make wine in the basement of his New York apartment building using concrete vats he constructed himself. According to Francis’s Uncle Mikey, they weren’t fancy wines, just pleasant, everyday drinking wines that anyone could enjoy. 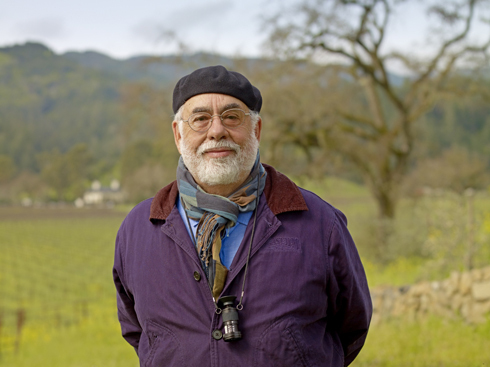 The wines Francis Ford Coppola makes today aren’t the same as those Agostino made, but they are produced in the same spirit: for sharing with friends and family. More than 35 years ago, when Francis and Eleanor and their children were living in San Francisco, the family began looking for a small cottage in Napa Valley they could use as a weekend retreat where they could make a little homemade wine. The family cottage they found turned out to be the great Niebaum Mansion in Rutherford on the famed Inglenook Estate. Suddenly, the prospect of restoring that legendary property sounded far more exciting than making a little bit of wine in the basement. Once they had successfully accomplished the estate’s restoration—a 30-year endeavor—the Coppola family decided to build a new winery in Sonoma County so that, at long last, they could create a home for their ever-popular Diamond Collection and Rosso && Bianco wine brands. 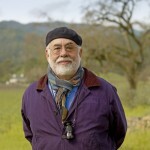 Today, the Coppola property is called Rubicon Estate, in honor of the company’s flagship wine, Rubicon, an ultra-premium Bordeaux-style blend. The Coppolas have spent more than two decades restoring the 125-year-old chateau and reuniting the original vineyards first planted in 1882. All Rubicon Estate wines are grown on the property, certified organic, and bottled and produced at the estate. In order to give their brands a home, in 2006, the family purchased the former Chateau Souverain winery, a large hospitality and winemaking facility in Alexander Valley, Sonoma County. Coppola’s wine collection includes Francis Coppola Diamond Collection, Francis Coppola Rosso & Bianco, Sofia, Francis Ford Coppola Director’s Cut, Francis Ford Coppola Director’s, Votre Santé, and Francis Coppola Reserve Wines. 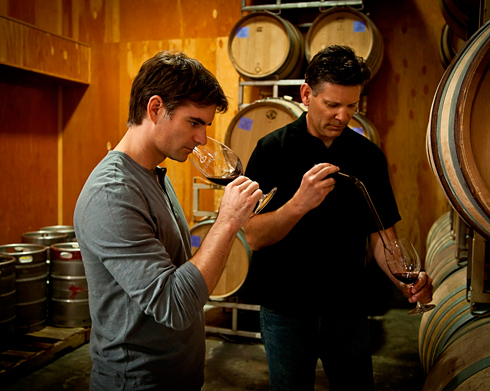 A four-Time NASCAR Sprint Cup Series champion and Vallejo, Calif. native, Jeff Gordon first discovered a love of wine in 1995 after winning his first NASCAR championship. Gordon was in London to celebrate, and when handed the wine list at an upscale restaurant, he yearned for the full experience. He ordered a bottle of Joseph Drouhin Batard-Montrachet and was surprised to see white decanted. Gordon took one sip of the white burgundy and declared it “liquid gold.” It was then that his passion for fine wine began. Gordon developed an appreciation for the art of winemaking in the years that followed and decided to create his own brand centered on the aspects of flavor and quality that he enjoyed in a glass of wine. The first vintage of the Jeff Gordon Collection—a 2004 Carneros Chardonnay—was released in late 2005, followed by a Napa Valley Cabernet Sauvignon and Napa Valley Merlot, also of the 2004 vintage. Gordon partnered with August “Joe” Briggs in Napa as his winemaker because of his knowledge and dedication to producing limited-quantity wines that excel in quality, and the two have introduced extraordinary wines ever since. 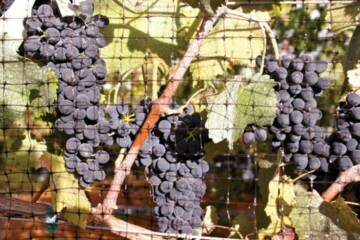 In addition to Chardonnay, Cabernet, and Merlot, they have produced Sonoma Coast Pinot Noir, Napa Valley Rosé of Syrah, and a signature red blend labeled “Joie de Vivre.” Because an average of only 250 cases of each varietal are produced, the collection is mainly available through JeffGordonWines.com. Jeff named his 2007 after his daughter, Ella Sofia, born that year, and named the 2010 after his son, Leo, born that year. For nearly a half century, Arnold Palmer has been one of the best-known sportsmen and businessmen in the world. As a professional golfer, he has won 92 national and international championships, 62 of them on the regular PGA tour during his prime playing years. These followed an impressive formative career that peaked with his victory in the 1954 US Amateur Championship. Most prominent among the professional titles were four Masters (1958, ’60, ’62, ’64), two British Opens (1961, 1962), and the memorable US Open Championship at Cherry Hills in Denver in 1960. Palmer and founder of Luna Vineyards, Mike Moone, share a long-standing friendship, and in 2003, they chose to collaborate and develop Arnold Palmer Wines. The brand combines high-quality, super-premium wines with a legendary name and global icon. 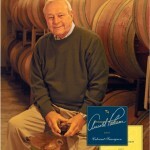 The first offerings from Arnold Palmer Wines, a California Cabernet Sauvignon and a Chardonnay, were released in the spring of 2005. Both are premium wines composed of grapes sourced from select vineyards in California’s most acclaimed winegrowing regions. “Since I hooked up with Luna, I’ve had a reason to be more involved with wine,” says Palmer. “I’ve learned something about the process, and it’s fun to think that you are part of something you enjoy so much. 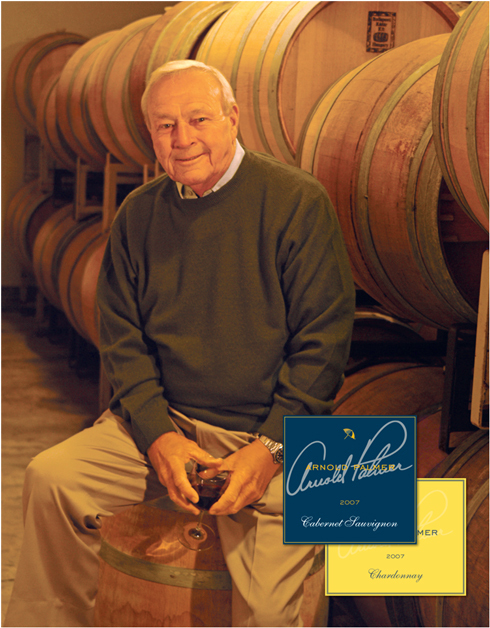 Mike is a good friend and he’s going to produce a good product because that’s what he does.” Arnold Palmer Wines are targeted to high-end restaurants, resorts, and wine shops around the country. 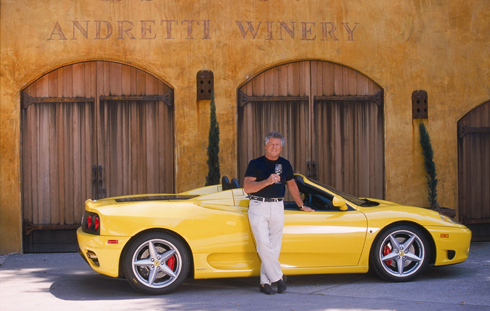 It has been said that wine is Mario Andretti’s second passion. He doesn’t actually remember the moment he fell in love with wine; it just happened over a period of time. It began while growing up in Italy, where wine is a part of everyday life, and when he was 15 years old, his family immigrated to the United States. There was a dirt track near his home in Nazareth, Penn., and his interest almost immediately was purely racing. He raced for five decades, winning just about everything: the Indy 500, the Daytona 500, the Formula One World Championship, and the Pikes Peak International Hill Climb. He won the Champ Car National Championship four times and was a three-time winner at Sebring. Andretti’s travels to exotic places—combining great dining with fine wine—led to his ultimate appreciation of wine as one of life’s pleasures. Andretti Winery’s 52-acre vineyard is situated in the heart of the “Oak Knoll District,” recognized as a distinct sub-appellation of Napa Valley, just a few miles south of the town of Yountville. With the cooler climate and rich soils that drain extremely well, the vines endure more stress, resulting in smaller, more flavor-intensive fruit. Ideally suited for growing world-class Chardonnay and Merlot, to which much of the estate is dedicated, the most favorable growing blocks of vines within this vineyard provide the grapes for the prized Montona Series Reserve wines. AWG Limited (Andretti Winery) is a publicly traded company (AWGL). Their wine club membership has grown to 2,000 members who receive quarterly shipments of a variety of wine products. From Napa and other California varietals to port and sparkling wine, the Andretti brand is becoming popular across the United States. The winery’s tasting room is open daily and by appointment for special tours. 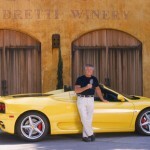 Wine orders can be placed at Andrettiwinery.com and are received at the winery in minutes for speedy shipping. In early 2007, hockey legend Wayne Gretzky and McCain Foods magnate Laura McCain entered into a partnership to create a portfolio of VQA wines produced in Niagara bearing “The Great One’s” name. The goal of the partnership was to create premium, 100% Niagara-grown wines that were affordable and delicious. In addition, funds generated by the winery would support Wayne’s Foundation, which provides underprivileged children with the opportunity to participate in hockey, as well as numerous other charitable activities. 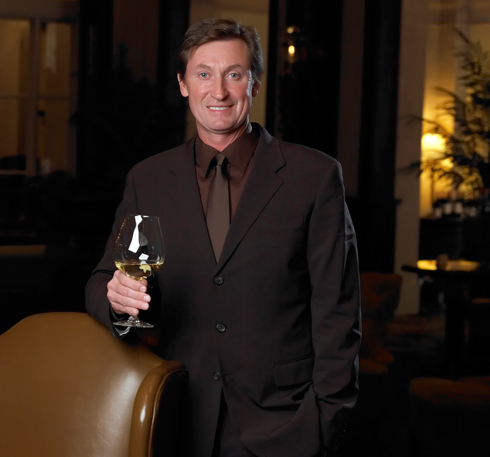 With the purchase of a small, independent winery in the heart of Niagara wine country, Wayne Gretzky Estate commenced operations on May 18th, 2007 with an official launch on June 23rd, 2007 at Gretzky’s restaurant in Toronto. Wayne Gretzky Estate is located in the township of Vineland, Ont. The winery began with a limited production of three estate wines: Merlot, Unoaked Chardonnay, and Cabernet Merlot. The wines were the creation of the Creekside team, headed by winemaker Rob Power, who has proven time and again that award-winning wines are as consistently attainable here as in any great growing region in the world. 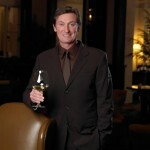 In 2008, the Wayne Gretzky Estate series of wines was created with the ambition of showcasing the unique terroirs found in Niagara, as well as highlighting the pedigree of the grapes grown there. The portfolio has grown over the years and includes several wines: Riesling, Sauvignon Blanc, Shiraz Cabernet, Chardonnay, and Cabernet Merlot. Many of the estate series wines have won top awards in provincial, national, and international competitions. The numerous awards and praise from wine critics have helped establish Wayne’s winery as a premium producer that is proudly 100% Canadian. Wayne’s wines are now available in every province in the country at both retail stores and upscale licensed establishments.